It’s cooling off out there and this spiked hot chocolate with bourbon and Grand Marnier is just what you need for your holiday get-togethers. Hey there, UDH readers! We’re Pam and Sara from Biscuits & Burlap, popping in to give you a little food inspiration to go with your DIY projects. This is our third time contributing to the Ugly Duckling House and want to thank y’all for welcoming us with open arms. Sarah introduced us a couple months ago with a round up of our readers’ favorite recipes and we followed it up with a couple recipes just for y’all including a Limoncello Cucumber Cocktail and an Herbed Goat Cheese Crostini with Roasted Cherry Tomatoes. 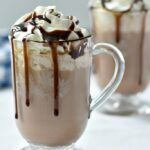 With the cold months quickly closing in on us, what you need is a spiked hot chocolate to warm you up after trick-or-treating, during chilly tailgate parties, and at holiday gatherings. The key to a great hot chocolate is starting with whole milk. If you must lighten it up, you could substitute 2% but don’t go any lighter than that and please don’t use water. This is your chance to indulge! Using brown sugar adds to the richness of this recipe and the booze? Well, booze just makes everything better. Start off with your milk in a saucepan and bring it to a boil. Remove it from the heat and stir in the cocoa, brown sugar and salt until dissolved. Last, stir in the bourbon and Grand Marnier and ladle into mugs. 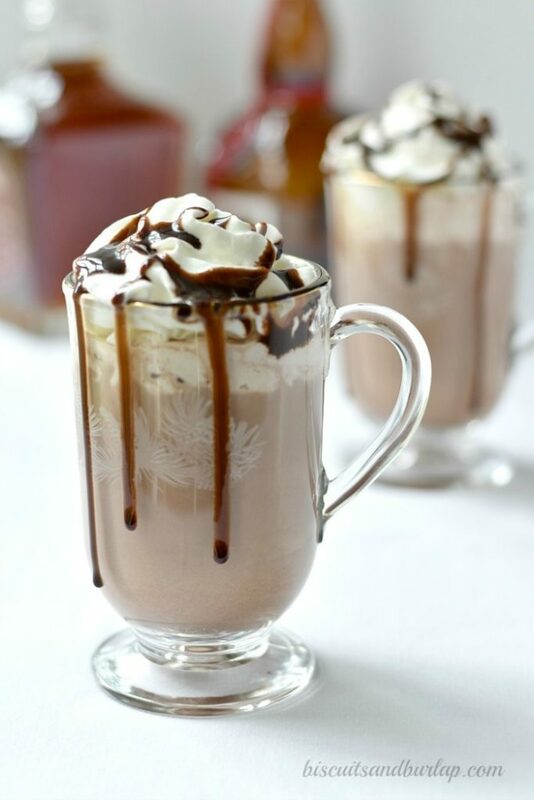 Top with whipped cream and garnish with mini chocolate chips, chocolate syrup, or a sprinkle of cocoa and orange zest and you have a yummy spiked hot chocolate! Bring milk to a boil in a medium saucepan. Remove from heat and stir in cocoa, brown sugar, and salt. Stir until dissolved. Add bourbon and Grand Marnier. 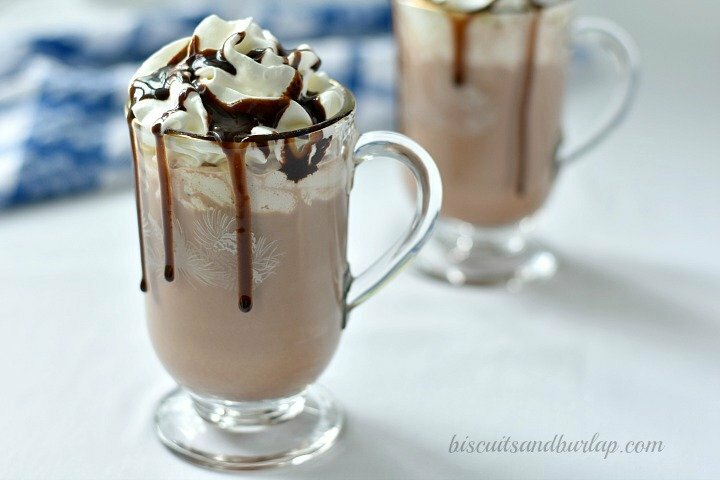 Pour into mug and top with whipped cream and desired garnish. Pam and Sara are the southern mother and daughter team blogging at Biscuits and Burlap. Food and drinks are their focus and they love to get creative, updating old-school classics with a kick of jalapeño or a splash of bourbon. Remembering their roots, you can also find them preserving vintage recipes just as they've been made for many years. Please take this with a grain of salt, and be open to the feedback. I have to be honest here, and it wouldn’t be a blog without honest feedback, both the good and the bad. I’m not a fan of this installment or partnership. This is not a recipe and feels very much just like filler advertisement. Its been very disappointing as a long time reader to see your content dwindle as much as it has. It feels mostly like sponsored posts or fillers. I miss finding that inspiration from the blog, and hope to see it return! 2) Overall (outside of this post, since you mentioned other sponsored posts), I get that sponsorship can seem weird or ill-fitting; sponsored posts can automatically seem forced just BECAUSE they’re sponsored and all that obnoxious disclosure. For the first five years of this blog’s life, I was working full time AND blogging, two full-time jobs — I’m happy and grateful that the blog grew enough to support me, but I still have no staff to handle the backend. I’m always learning new things to do that side better so I can create more content and still comply with all the rules that now exist and keep sponsors happy for long-term relationships. Recently, my partnered posts (where I’m working with a brand in ANY particular way) increased during the summer/fall, which I addressed here. The reason was mainly wanting to fund the large shed project and the future deck build in 2018 in advance, which is going to cost a crapton of money but should also be so EPICALLY awesome to learn how to build that I’m genuinely excited for it. I pay for my living and operating expenses with ad revenue, but since that’s not enough to pay for it all, sponsored posts pay for project budgets. There are a number of different things that factor into whether I accept a sponsor. The first, of course, is whether I think it will be fun/creative enough for myself to actually do AND for readers. The second is if I happen to be doing a project ANYway and a sponsor comes along in the same category (which strangely happened this year a few times, such as when I already have hydrangeas from the same company who then wanted me to do another project using their plants). I’m open to getting them involved because it’s still something I was already doing and helps pay for the project AND the next project. The downside is that the required legal disclosures can make it seem more forced even though it was organic all along, and that’s always a struggle for any blogger to comply with rules and still write how we want to and keep a nice balance (after all, I talk about products I use whether it’s sponsored or not). Unlike most full-time jobs where you earn your living and move on with your day, HOW I earn my money through the blog is required disclosure by law, especially as of late. Every post, whether it’s a free pencil or a paycheck, requires a disclosure if you’re earning from it in some way (and “in some way” is where gray areas begin and can get you in trouble). Well said, Sarah. What a balancing act! DIY blogging is a peculiar kind of beast. Not only is there content creation, site maintenance, photography, social media, sponsor relations, and reader interaction, but somewhere in there, physical project work actually has to get done. It’s all chewing away at time, energy, and money. It’s just unsustainable to blog without revenue streams to keep offering readers free content. Readers may not realize how many sponsorship opportunities quality bloggers filter out because products don’t fit, are nonsense, or simply come from scumbags. I think you balance it better than most, better than I do for sure. I think it’s fine to add guest posts to expand audience and take a little pressure off. I honestly don’t know how you generate great content as often as you do. Thanks for chiming in, John! Means a lot to hear that come from you. And can I add that I am still SO JEALOUS that you went to that Dewalt event earlier this year, ha! I love their tools and can’t wait to share some of the skills I learned at STIHL (seems like something that would be totally up your alley). Look for that in the spring! I love making this in cold weather. Ran across your blog when I was looking to see if anyone else had a penchant for bourbon, hot cocoa and grand manier! Enjoyed the post. Glad you stopped by, Chandra! This is definitely a booze-friendly blog 😊. I only just recently started sharing recipes, but lots of family recipes and cocktails are on the way!